Future IT Spending- Can we afford it? After listening to the recent School Committee and Select Board presentations by Kevin Warenda, Longmeadow’s IT Director, I have become concerned about the future level of IT spending. Between 2007 and the Fall of 2013 when the new high school is opened, Longmeadow will have spent over $2 million on IT related infrastructure not counting any new programs that will be implemented. Below are video clips of Mr. Warenda’s remarks at the June 13 School Committee and June 20 Select Board meetings (courtesy of LCTV). A large portion of current IT infrastructure- both town and school related is in dire straits and needs to be replaced. Many of these IT related resources are either past life expectancy or are no longer covered by vendor tech support and are likely to fail unexpectedly and have possible disastrous consequences in the next few years if not resolved soon. This infrastructure includes network servers, computers and software and in a number of cases involves town and school mission critical systems. There is a strong need to upgrade the computer technology available in classrooms at all levels. The State of Massachusetts is now recommending that school districts plan to upgrade available computer resources to meet a 1:1 student/ computer ratio by 2015. Longmeadow currently has 1350 student + staff computers- many of which are 3-5 years old and not capable of multimedia applications and do not utilize the latest software programs. Mr. Warenda indicates that we will need to almost triple the number of school related computers (-->3500 -4000!) during the next few years. In addition, we should be prepare to replace computers on a 3-5 year timetable. Mr. Warenda proposed the following SC/SB expenditures..
Upgrade town and school servers and implement new disaster recovery and backup plans for mission critical information. Implement programs to reduce student/computer ratio by purchasing IPad computers for use with mobile learning labs at the 6 district schools. First year cost = $59K- a portion of future costs will be paid by LEEF, PTO and other grants. This is the first step toward meeting the 1:1 student/ computer ratio guideline. Expand the existing wireless network to allow for significantly increased computer access. Cost was not specified. 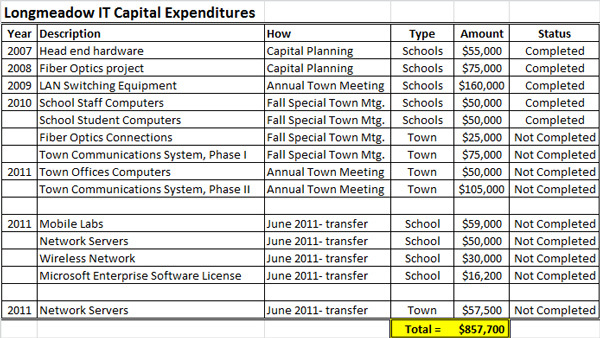 Below is a summary of town/ school IT Capital Expenditures for the past 4 years (including the above) totaling $857K. I also reviewed the FFE (Furniture, Fixtures and Equipment) estimates for the new high school project and found a total of $1.2 million of computer related items (not including computer related furniture). Here is a link to this documentation. I think that Mr. Warenda has done a good job of critiquing our town’s IT infrastructure and putting a plan together to remedy the shortcomings. Some missing pieces include a detailed view of staff needs to support the planned IT expansion. The proposed increase in the number of school + town computers and network infrastructure will likely require increased staff training, IT support and a significant increase in staff or outside resources. Our town has many other needs that will require significant outflows of taxpayer dollars. The latest spending request from our IT Director comes only 5 weeks after our annual town meeting for items that were clearly identified earlier in the year and could have been voted on at the ATM. The IT consolidation that occurred on January 1, 2011 has essentially disconnected prioritization of IT projects and resource needs from the rest of our town’s capital needs. At their June 13 meeting the School Committee simply transferred unspent money from various line items for the latest $50K expenditure and the Select Board used unspent monies to fund their $57.5K portion of the IT infrastructure upgrade. All of this money would normally have reverted to free cash at the end of the fiscal year on June 30 and become available for other uses at the Fall Special Town Meeting and beyond. From these recent events, it certainly looks like this approach of bypassing town meeting has become a new funding mechanism for our growing IT capital needs. I am a great believer in the value of technology in our schools and the business world. However, we cannot afford to spend for IT infrastructure at these high levels and simply ignore our other needs as a town. I would like to see the Capital Planning Committee include IT spending as they look at the entire town’s capital needs so we can spend our limited financial resources wisely.